Multiple narratives spin together with appealing elements of a spiritual journey and a historical quest. 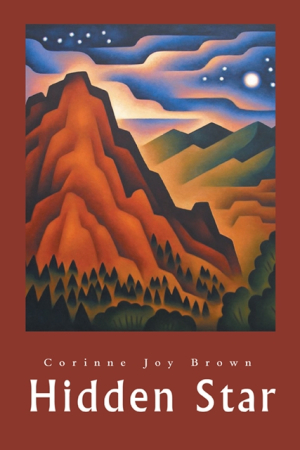 Corinne Joy Brown’s Hidden Star is a fascinating Southwestern historical novel that ties a small community to the Spanish Inquisition in revelatory ways, incorporating anecdotes from the modern era and from the troubled times of the Inquisition itself. Rachel Ortega, wife, mother, and diner owner, is descendant of conversos (crypto-Jews) in a small Southwestern town. Hidden Star follows her evolution—from a harried woman with an abusive husband and a troubled teenager, to a more spiritual soul who comes to recognize “an inheritance, a heritage, and a relationship to God, a covenant.” Meanwhile, her sons Ángel and Juan run away from home. These narratives spin together as journeys of discovery and reconnection in which the spiritual is tied to the familial. Rachel is a well-developed character, one whose evolution flows naturally through the story. Her love for her troubled teen becomes clear on these pages, as does her growing intimacy with José Flores, the local law enforcement officer. He too is drawn empathetically, with elements of backstory revealed naturally within the course of the novel. It is through these two characters that a link to the Inquisition becomes clear. Secondary characters, including a Navajo man, a priest, and Rachel’s father-in-law, join the narrative and become useful catalysts to bring the story to its natural conclusion. The novel meets its goal of defining crypto-Jewish history and heritage, especially with the incorporation of source references. These historical explanations possess the clarity that the esoteric subject demands. The stories give more with careful reading, for the subject is unusual, even obscure, and the pacing is slow. Hidden Star is not an action-driven novel, although there are elements of tension related to the escapades of Rachel’s two sons. There is drama, too, in the thoroughly believable look back at the dramatic events at a 1790 wedding, an anecdote that opens and grounds the novel. Slower, deliberate pacing helps the novel to become a spiritual exploration as much as it is a mystery linked to the boys’ disappearance. Such movements also mean that the book requires methodical reading, and opens best to those who already share an interest in its subjects. The prose is solidly grounded in its New Mexico setting: open skies, purple-topped mountains on the distant horizon, and deeply rooted Latino culture founded in familial loyalty all frame the setting of the novel. Corinne Joy Brown’s Hidden Star will be best appreciated by readers who enjoy discovering long-hidden secrets revealed within historical fiction.